The civilization of Ancient China dates back thousands of years. Over this long period of time much of China was ruled by different dynasties. A dynasty is when one family rules a country or region over a long period of time. Generally, the head of the family will be the ruler of the land, like an emperor or king. When that ruler dies, another member of the family will take power, usually the oldest son. When a new family takes control, then a new dynasty begins. The Mandate of Heaven is what the Chinese people believed gave their rulers the right to be king or emperor. It meant that the gods had blessed that person with the right to rule. A ruler had to be a good and just ruler to keep the Mandate of Heaven. When a ruler or dynasty lost power, this meant that they must also have lost the Mandate of Heaven. Xia (2205 to 1575 BC) - The first dynasty in China, very little is known about the Xia. Shang (1570 to 1045 BC) - The Shang ruled much of the area along the Yellow River. 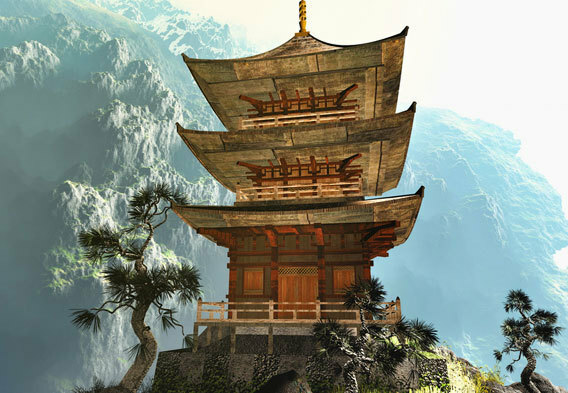 Their last capital city was the great city of Yin. Qin (221 BC to 206 BC) - The beginning of the Chinese Empire, Shi Huangdi became the first Chinese Emperor. Although this was a short dynasty much was accomplished including the beginning of the Great Wall; standards were set for weights, measures, and money; many roads and canals were built; and a single type of writing was used throughout the country. All of these advancements would be used in future dynasties to make China strong. Han (202 BC to 220 AD) - The Han dynasty established the civil service to create a strong and organized government. Paper and porcelain were also invented during this time. The Han also embraced Confucianism, poetry, and literature. Six Dynasties (222 to 581 AD) - A period of time where China was not united under a single leader. Sui (589 to 618 AD) - The Sui unite China again under one rule. They also expanded the Great Wall and built the Grand Canal. Tang (618 - 907) - A period of peace and prosperity, the Tang rule is sometimes known as the Golden Age of Ancient China. Arts, literature, and technology all flourish. The capital city Chang'an becomes the world's largest city. Five Dynasties (907 - 960) - A peasant rebellion takes down the Tang dynasty and ushers in a period of division. 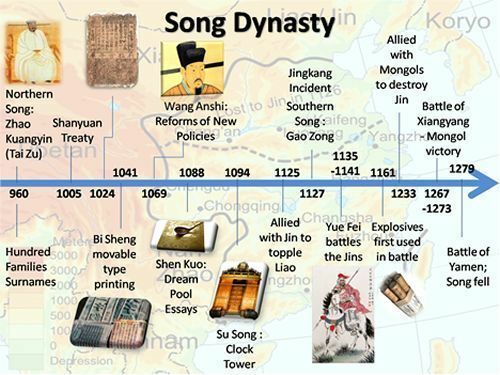 Song (960 - 1279) - Reunited under the Song, China becomes a world leader in science and technology including inventions such as gunpowder and the compass. Yuan (1279 - 1368) - After the Mongols defeated the Song in a long war, Kublai Khan, a Mongol leader, established the Yuan dynasty. Ming (1368 - 1644) - The Ming finished the Great Wall and built the Forbidden City, an enormous palace for the Emperor. The Ming came into power by overthrowing the rule of the Mongols. Qing Dynasty (1644 - 1912) - The last of the great Chinese dynasties. The Qing Dynasty comes to an end with the Xinhai Revolution.